In the Conker Tree Science project we have not specifically been studying the effects of bleeding canker. However, bleeding canker is the biggest threat to our horse-chestnut trees because it cancause the death of the tree, and branches that have been badly affected can be dropped by the tree, so it requires careful management for the safety of passers-by. Local authorities and tree owners have been carefully checking their horse-chestnut trees, and trees have been managed appropriately and in some cases they have been felled. It is possible that the spread of the leaf miner and the effect it has on the tree's photosynthetic capacity is weakening trees, so making them more susceptible to bleeding canker, though this requires further research. 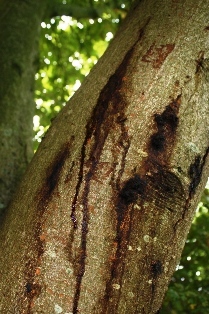 You can find out more about bleeding canker via websites at Forest Research or Royal Horticultural Society.